Happy August! It’s time for our pair of prompts to make you more creative and more productive. For those of you who haven’t joined us yet, each month in 2017 we’re providing a pair of prompts: one to make you more productive and one to improve your creativity or writing skill. Feel free to try one prompt or both. You can join the fun anytime you like. And let us know about your experiences in the comments! This month’s prompt is inspired by Jessica Abel’s excellent book for creative souls, Growing Gills: How to Find Creative Focus When You’re Drowning in Your Daily Life. I’m presenting the very start of her program here as a bit of a “hack,” but the strength of Abel’s book is that it isn’t a collection of hacks. It’s a smart, flexible, and comprehensive system that lets you make more progress on your creative work — including the kind that you don’t have a deadline for yet. For the next week or 10 days, keep track of how you spend each hour of your day. You’re not going to figure out your priorities (yet). You’re not going to decide what to attack during your most productive time (yet). You’re just going to make quick notes as you go through your day about how you’re spending your time. Just like tracking what you eat or how much money you spend, tracking your time gives you a clarity you won’t get any other way. It lets you get real about what you’re doing hour-to-hour. I swiped this tactic as the prompt for the month because I find I get a lot out of it, but I advise you not to stop there — go pick up the book for yourself. It really stands out from the sea of silliness in that genre. Your creativity excellence prompt for August is to find a crossroads. Writing good stuff takes a lot of time, energy, and passion … but you also probably spend some time, energy, and passion on other things. Maybe you spend a lot of time hiking, or gardening, or training naked mole rats. You might be passionate about Little League coaching, the environment, or Italian food. This month, bring some of your “off topic” passions into your content. Now, you still need to make it relevant to your audience. This isn’t a permission slip to create content they don’t care about. Your job is to look for unexpected connections. How can you bring your passion for Marvel comics into your fitness business? Where are the points of intersection between your love of Mark Twain and your personal finance blog? Nearly 10 years ago, Brian called this the “content crossroads” — the point at which seemingly unrelated ideas connect. And there are always interesting things to be found at the crossroads. Joining us for one or both of the prompts? Have you ever tried tracking your time in the past? Let us know in the comments! Very intriguing prompts Sonia. I will definitely be partaking in the productivity prompt, thanks for sharing! What a cool concept! And an invitation to find creative ways to incorporate other passions into my writing passion – how fun! I love this concept. I just started a blog and I’ve been struggling to think of unique ways to come at the topic. This blog post gave me some ideas. Thanks! 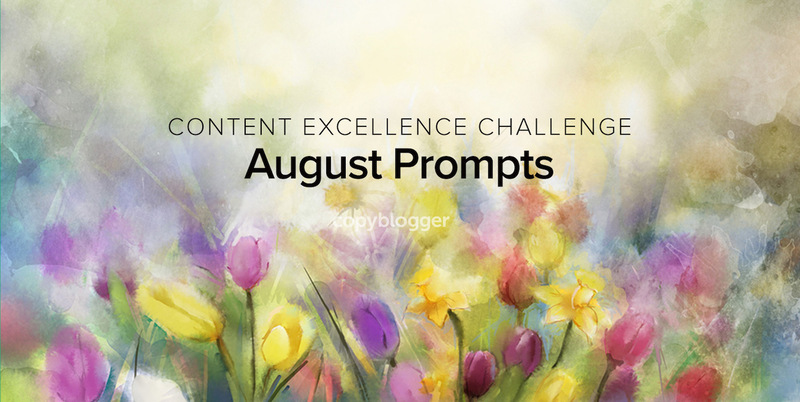 I love the August creativity prompt! Too often, I get inside my head trying to always be writing about what is trending in the marketing world, and sometimes it stifles my creativity. This month I will definitely be bringing some of my other passions into my content. What an interesting concept! I’m forever finding connections between events in my life and my life’s lessons – so I’m interested to see how this creativity prompt shows up for me. AND I’ve just spent nearly 2 hours on replying to emails and FB comments that appear to be important. It’s a timely reminder to schedule in the time to respond and also allow time for my writing. Many thanks for this month’s prompts.